Bulletin Board -- update on progress toward the new 3A/3B web forum. Baltimore County: Part 2 -- the Jeeps of the volunteer fire companies. Baltimore County's Fire Jeeps: Part 1 -- the unique history of BCoFD's 40 Jeeps (above). Spring Willys Reunion 2019 -- 17-18 May in Aurora, Ohio. Cross Country Camping in Comfort -- bulletproof 1958 3B and trailer in Queensland. On the Beach -- we now have the winning caption for this vintage photo. The Mystery Machine -- '58 in Wisconsin with a Scooby Doo paint job and mystery PTO. Willys CJ-3B: The World's Jeep -- coffee shops, volcanoes and more. Six More Weeks of Winter? -- not this year, says the groundhog. 1953 Danish Army CJ-3B -- new in 1953 Owners' Photos. Camprodon: Jeep Capital of Spain -- local Willys owners display their Jeeps. 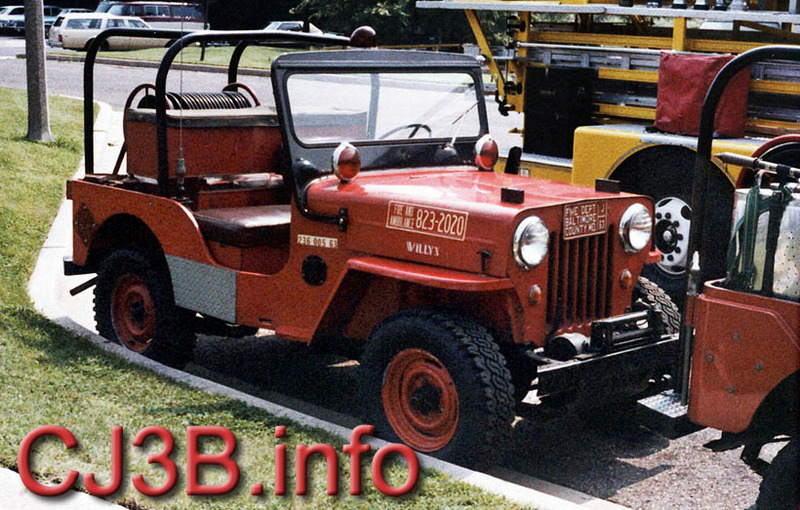 Boyer CJ-3A Jeep Fire Engine -- BJ with an interesting history. 1955 Owners' Photos -- resto starts on family Jeep in Wisconsin. Jeepneys of the Philippines -- older ones will be disappearing. Universal is Right! High Hoods Everywhere... -- including the South Pacific. Restoration of a Fresh-Air Heater -- Chuck Watford upgrades the interior of his '64. CJ-3Bs on Ice -- more photos of the early Zamboni® Jeeps. World's Largest Jeep Grille -- in Texas of course, new on the "Believe It or Not" page. Matchbox Playsets -- 1980s and 90s dioramas, new in the Toy Jeeps Pages. Swiss Army Jeeps -- including 1955 newsreel film of CJ-3Bs on night maneuvers. 1961 Owners' Photos -- Swiss Army CJ-3B goes U.S. Army. Snow Jeeps -- now we know when and where this ski hill traffic jam took place! Airfield Crash Rescue Jeeps -- from World War II to Wrangler, including some CJ-3Bs. "Where a Man Belongs" -- long-wheelbase CJ-3B in 1980 ad campaign for Camels. Building Myself a 1957 CJ-3B -- Gary McCourt takes us through his 9-year project! Calendar Art by Walter Baumhofer -- Jeeps and bears! West Vancouver Unit 34 -- Sterling CJ-2A fire engine with an interesting history. Mint 1960 CJ-3B -- Bob Miksch's super-low-mileage Jeep in Ohio. CJ3B-01 -- is this mystery Jeep the first CJ-3B? Please see the Table of Contents for the other 1500 pages on the website. CJ3B.info is created by Derek Redmond in Kingston, Canada. All content not credited and previously copyright, is copyright Derek Redmond 1996-2019. Submissions of photos or articles are welcome. You can Contact CJ3B.info by e-mail, and add a surviving Jeep to the CJ-3B Serial Number and Engine Number List.